(Housekeeping), Food & Beverage Services. ASDM has released total 30 vacancies on contract basis. 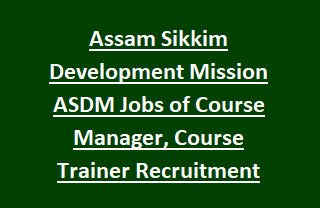 Application forms for Course Manager/ Trainer Vacancies available at ASDM official website www.asdm.assam.gov.in. Online Application link available from 15th November-2017. Candidates must write the name of the post in the subject line and submit the application with supporting documents before 30th November-2017. Selection of candidates for ASDM recruitment is based on written test/ Interview. Full details regarding Educational Qualifications, Age limit, Experience, Remuneration, Application Procedure of Assam Skill Development Mission Limited ASDM Course Manager, Course Trainer Recruitment are mentioned in the notification link given below. Total Vacancies available in Assam Skill Development Mission Limited ASDM Recruitment are 30 posts. - Course Manager (Beauty & Wellness): 01 post. - Course Manager (Retail Services): 01 post. - Course Manager (Hospitality Operations) Housekeeping: 01 post. - Course Manager (Food & Beverage Services): 01 post. - Course Trainer (Beauty & Wellness): 05 post. - Course Trainer (Retail Services): 05 post. - Course Trainer (Hospitality Operations) Housekeeping: 08 post. - Course Trainer (Food & Beverage Services): 08 post. Candidates have to visit the ASDM official notification for qualification details. Please go through the ASDM official Website for age limit and relaxation details. Pay Scale offered for Course Trainer and Course Manager Jobs as per Assam Govt orders, please check the advertisement link. ASDM Recruitment selection will be based on candidates merit in written examination/ Interview. For more details regarding selection process please go through ASDM official Notification. Eligible/ Interested candidates are advised to go through Assam Skill Development Mission Limited official website www.asdm.assam.gov.in and apply for Course Trainer and Course Manager Jobs. Candidate must write the post name in the subject line and submit the application with concerned documents to recruitmentnesc.asdm@gmail.com. Application forms available from 15-11-2017. Last date for online application form is 15-11-2017. For more details please go through www.asdm.assam.gov.in.